The recent rash of news alerts about the all-time-low, end of summer, Arctic sea ice extent has certainly given new food for thought about the state of the climate. Of course we shouldn’t be entirely surprised by this state of affairs as more rapid warming at the poles was anticipated long before the issue of rising emissions became a reality that we would have to deal with. 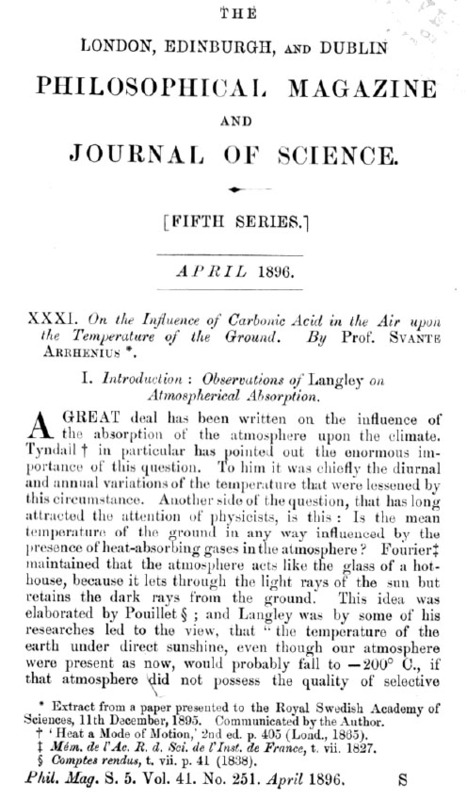 Back in 1895, Svante Arrhenius came to the conclusion that “temperature of the Arctic regions would rise about 8 degrees or 9 degrees Celsius, if the carbonic acid increased 2.5 to 3 times its present value”. Fortunately we haven’t reached this level of atmospheric CO2 or warming just yet, but nevertheless the message was there 120 years ago. So it was timely to be able to hear from a current expert on the subject of the Arctic at the 34th MIT Global Change Forum held in Canada last week. The speaker was Professor Louis Fortier, Scientific Director, ArcticNet, Université Laval. Somewhat depressingly, the news was worse than the already worrying news of that week, shown above. Firstly, Professor Fortier showed how climate models verified the findings of Arrhenius. 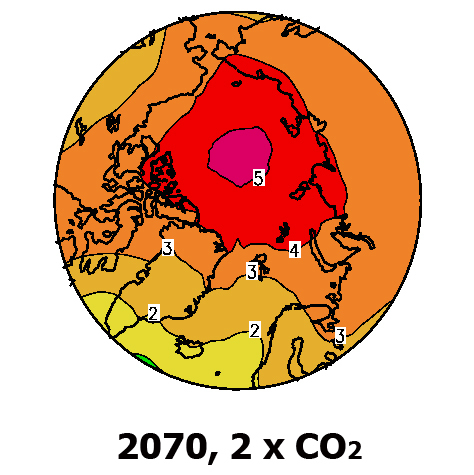 In a 2070 world with CO2 at 550 ppm, warming in the Arctic is seen to be 5°C, compared to 2-3°C in lower latitudes. But the really alarming news came when the discussion moved from 2D to 3D. Although we think of floating ice in the 2D context, it does have some thickness. This is caused by the buildup of ice from year to year, starting with ice that survives the previous summer melt which then increases in thickness during the winter. Thirty years ago, “old ice” (layers in the pack some 5-10 years old) made up some 50% of the floating pack at the end of the summer melt. Today, there is almost none of this remaining, with the ice at the end of summer consisting of the thin remnants of the winter freeze. The 2D view shows that September ice extent has declined by about 50% since 1980. But the 3D view which incorporates the measurements of ice thickness shows an even more worrying trend. 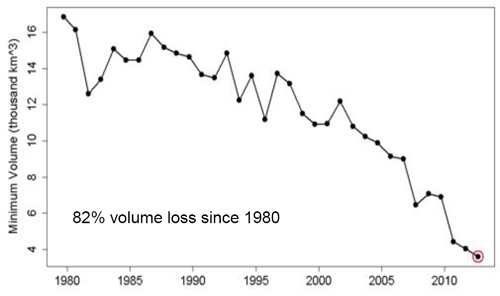 Ice volume has declined by 82% since 1980. David presented somewhat simplified view on sea ice. Let me to present somewhat more complex analysis. First, summer extend of Arctic sea ice is declining for about 30years but winter extend remains more or less the same. This has to be somehow related to increasing sea temperature in Atlantics and above land in the North Hemisphere. There is a strong warming trend for last 30years. It is tempting to say this is caused by elevated CO2 concentrations and many people jump on this bait. The curious thing is that North Pacific hasn’t warmed at all. Also South Hemisphere has barely warmed and sea ice in Antarctic has even increased. This is quite inconsistent with alleged uniform CO2 warming which should be strongest over the (both) poles and weakest in tropics. There is some other phenomenon which causes Atlantic ocean and land mass in the Northern Hemisphere to warm faster than the other parts. This year extreme loss of summer ice was definitely caused by thinner ice. 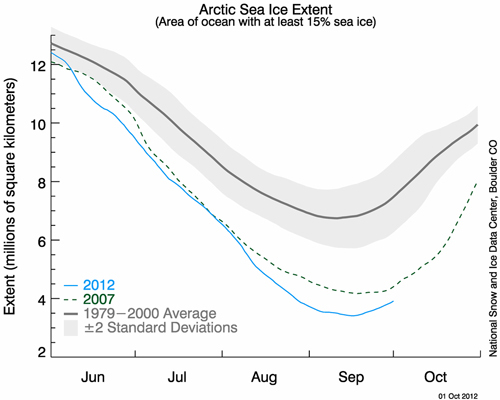 However, this winter the Arctic sea ice extend was close to 30years normal. One strong Arctic storm in the beginning of August was enough to break thinner ice and push it all over the Arctic Ocean where it either melted or disappeared from the statistics as its concentration dropped below 15%. No doubt the ice extend will recover during winter to where it normally is. 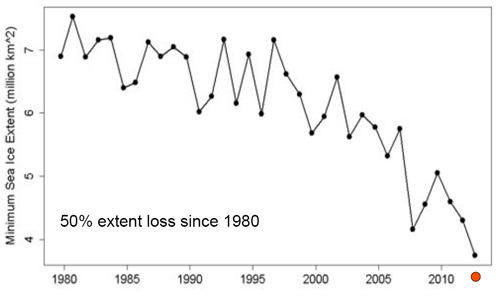 It is also clear that the multiyear ice (thickness) will be much harder to recover. The question is to what degree this phenomenon is caused by CO2 concentration. There are other players like natural oceanic cycles, soot particles, anthropogenic land use changes, solar changes etc. The important question is how the Arctic sea ice extent can affect human society and biosphere. At first sight it might seem to be positive as winter appears to be less severe – killing less life and causing less damage. There are fewer icebergs threatening ships and Arctic can open up to the economic activity. This should be seen as a big opportunity. Regarding sea life I would be worried more about fishing industry rather than oil&gas. This is a new multiproxy reconstruction of NH (North Hemisphere) temperatures of the last millenium. I think that this clearly falsifies Mann’s hockey stick reconstruction. BTW, this new study even used the same infamous Yamal proxy used by Mann. Yamal has strong hockey stick shape (due to the poor sampling methodology) and due to the Mann’s biased procedure skewed his reconstruction. Yamal proxy is an unfortunate heritage of IPCC guys and is probably destined to plague climate science for some more time. Anyway, this reconstruction clearly shows strong medival period at similar levels to today warm optium. It is clear that NH temperatures dropped from medival climate optimum without any CCS or terraforming. It is quite likely that the same happens to the current climate optimum. I guess that climate science is recovering from the bad IPCC science. Hopefully our economy will recover from the green policies too.